This year seven awards were given in five categories. A new category called rehabilitation was initiated this year. One special commendation was also awarded. Your editor reviews Bibsy, a historical novel by Brenda Ross, set in Rockland County circa 1950. COVER PICTURE. Bouquets of flowers, provided by Historical Society Trustee Madeline Muller, graced the tables at the 2017 Historic Preservation Merit Awards Country Supper. 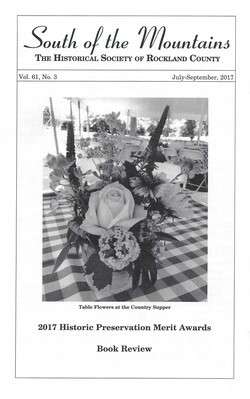 Back issues of South of the Mountains, from 1958 through 2013, are digitized and can be viewed at www.hrvh.org. A direct link can be found at www.rocklandhistory.org.